No one can match the taste of Applebees Quesadillas. This CopyKat version of their quesadillas comes pretty close. Be sure to serve with your favorite guacamole and sour cream. These cheesy, tortilla appetizers from Mexico, are easy to make and everyone will love them. What will make this simple dish special are the authentic ingredients Applebee’s uses? Now you can make authentic Applebee’s Quesadillas because I’ve broken down all the ingredients for you. Pico de Gallo is actually a fresh, tomato salsa made by seeding and chopping tomatoes, chili peppers, onions, and cilantro. But I believe that Applebee’s uses something similar to Goya’s Pico de Gallo sauce, which you can find in the Mexican food section of your grocer. If you want to rev up your ‘dillas, then go for the fresh stuff. Most grocers have fresh Pico de Gallo available in small containers, in the fresh vegetable section. Since my recipe only calls for a tablespoon, try pouring leftovers over tuna steaks or serving it atop your favorite nachos. Picante sauce comes in many forms and has many names but it’s always red… and hot. When shopping for this ingredient, look for names like Picante, Sriracha, Hot Sauce or Hot Chili Sauce, and choose from mild to medium to hot-hot. Colby and Monterey Jack cheeses are both American, cow’s milk cheeses, named after the towns they come from: Colby Wisconsin and Monterey California. They are often compared to cheddar, though are milder in flavor to cheddar. And they are often sold as Colby-Jack, in a marbled brick or combined with a shredded mix. You can use either one if that’s what you’ve got in your ‘fridge but I prefer the taste of both. With this much knowledge, you can make Applebee’s Quesadillas your signature dish. Applebee’s Quesadillas are the perfect go-to food when you’re entertaining or filling a buffet table. Though no one can match the taste of Applebee’s Quesadillas, this CopyKat version of their famous quesadillas comes pretty close. Be sure to serve them with your favorite guacamole and sour cream. 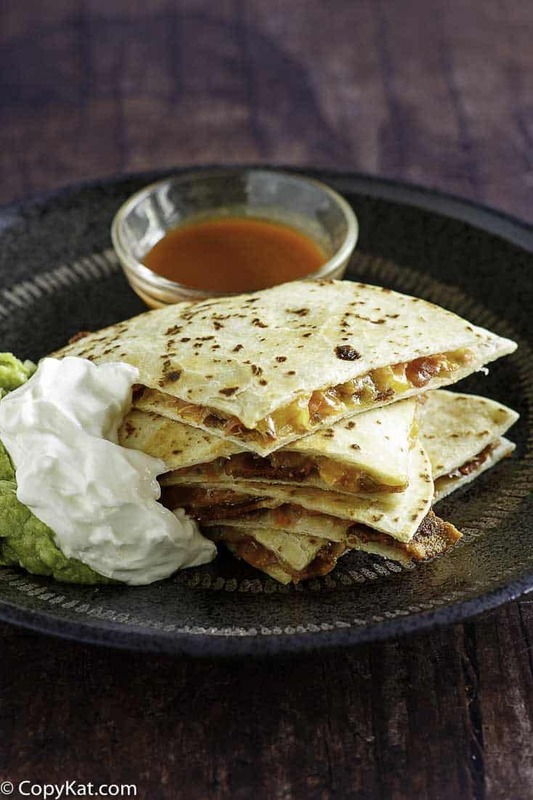 Enjoy these amazing Applebees Quesadillas when you make them at home. Slice bacon and fry until bacon starts to turn crisp but not hard and brittle. Remove from pan, drain bacon and set aside. Spread butter lightly on one side of the flour tortilla shell. Place buttered side of the shell down, into a non-stick fry pan that has been preheated on medium heat. Sprinkle 2 tablespoons of bacon over entire shell, then add 1 Tbs. Pico de Gallo, and 1/4 cup shredded Colby/Monterey Jack cheese over the bacon. Place the second flour shell on top of fixings, buttered side up. Cook for about one-two minutes just long enough to heat the inside ingredients and then carefully flip the quesadilla on the other side and finish cooking. The quesadilla should be heated through but not browned. Remove quesadilla and place on a serving dish and cut into individual triangle serving pieces. 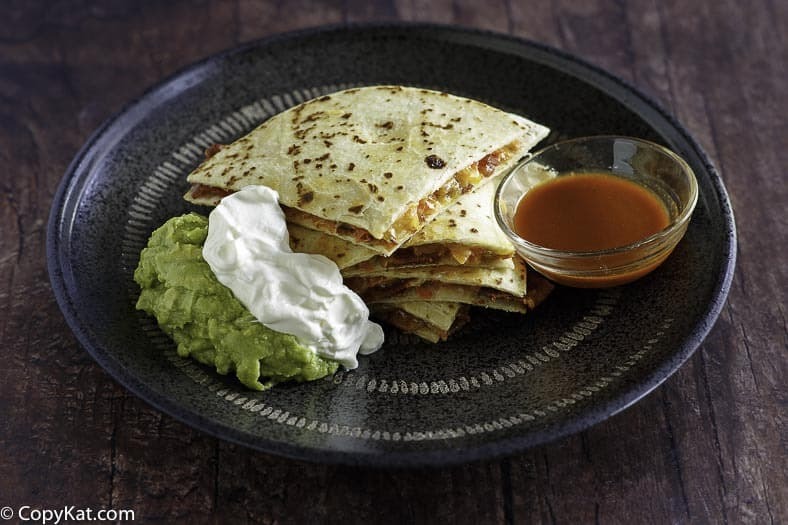 Serve quesadillas with your favorite guacamole sour cream, and Picante sauce. You can find many more copycat restaurant recipes that taste just like Applebee's Restaurant Recipes here at CopyKat.com. I would ask Applebees, my recipe it is not processed. I am sorry I don’t have this recipe. I will note your suggestion. Having worked for Applebees as a GM for 7 years, we would drain fresh-made pico and mix the cheese/bacon bits in with it & portion into 5 oz. portions for food cost control and consistency of product. We used six-inch shells for the small quesadillas (2) & 10-inch shells (1 folded over) for the large chicken & steak quesadillas. If you don’t have a kitchen scale to weigh out the filling, a large “handful” of filling is about 5 oz. This recipe was so close to Applebees. Loved these, I made these for the family they were so easy to make. And easy to.